So– you’ve made it through the second week of school and are patting yourself on the back for a job well done. The kids seemed to have eaten their lunch (at least the lunchbag comes back empty) and all is well. Only 60 more lunches to make until the Winter Break… but who’s counting? Wondering how you can come up with even more healthy lunch ideas that your kids will actually eat? The following tips will help make sure your kids happily anticipate their lunch instead of tossing or trading it. Get a kid’s perspective on lunch. School Lunch Provides Healthy Options! When there is no time to pack a lunch, there are 2 options: buy at school or bring a pre-boxed lunch. While school meals have gotten their share of brow-beating, it’s not as bad as you think. In fact, it’s much better than the menus might give away. 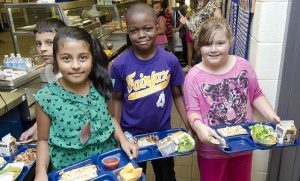 School lunch must meet USDA nutritional guidelines, which have gotten stricter in the last few years. The food rules insure your child gets a balanced, nutritious meal while at school. But what about burgers and hot dogs on the menu? Here’s what’s not on the menu–hot dogs are reduced fat because they’re made with turkey or chicken, beef is often a beef-soy mix–also to reduce the fat. As I like to explain to parents, school lunch is serving to a clientele that is used to Happy Meals, personal pizzas and bento boxes. It’s tough crowd to please, be sure of that! So to get enough business, they have to please those picky palates, while offering healthy foods. 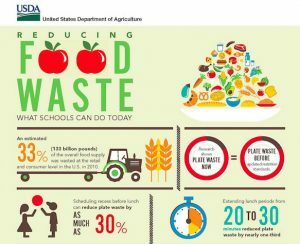 You can help stop #foodwaste at school! There are many teachable moments at lunch time. 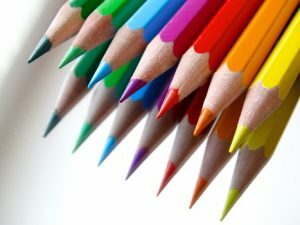 Schools have the option of “offer” vs “serve”. In our schools, it’s “offer”–that means your kid needs to pick 3 things off the line–one must be a fruit or veggie. (This is to reduce food waste.) The good news, is again, if your kid picks it, he is more likely to eat it. The bad news is, he can walk away with the main entree, (which could be pizza), along with bread and corn. Yep it’s definitely a starchy meal…here’s where mom’s or dad’s influence comes in. Looking at the menu ahead of time, which is usually on the school or school district’s website, offers a way to discuss what’s on the menu with your child and what he might pick.It’s also a good time to teach your child about food waste. And by the way, it’s always a good idea to take the time to eat lunch with your child, so you can see what’s on the lunch line. And–how much trading and tossing is going on! I see Lunchables as definitely not an everyday thing, but an option as a treat or when all you have is 5 seconds to put lunch together. (When my kids were growing up, I rarely bought Lunchables but often packed my own with whole grain crackers and fruit!) With the cool bento boxes available, it’s makes it easy for you (or even better, your child) to put together his own box. But I also see some teachable moments for Lunchables. They are perfect portions for a kid–even for overweight kids and they provide a moderate calorie, balanced lunch that has “cool” appeal. 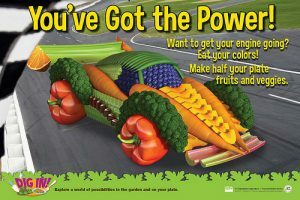 You can make a difference with your child’s eating habits! (And I don’t mean a candy bar!) Sending a little note in the lunchbag is a great way to let your child know you’re thinking about him. A post-it note is perfect for this. Jot out a little poem, or just say I love you!